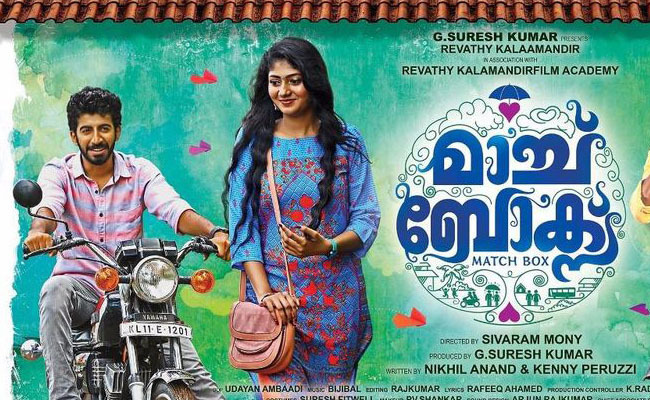 MatchBox Movie Review: Movies have to boast an impressive story in its kitty if they really want to impress the audience. Well, if you can present an oft repeated story with an innovative treatment, then too chances are bright for you to win the heart of movie goers. Matchbox, a Sivaram Mani directorial sadly fails to cater the needs of both segments. Set in the backdrop of Kozhikode town, the movie tells the story of a group of youngsters, mainly consisting of Ambu (Roshan Mathew) and Ashok Raj (Visakh Nair). Well, they lead their life with all the fun moments, which typical urban Kozhikodan boys enjoy. Into their carefree youthful days, comes a young beautiful girl Nidhi (Drishya). She sweeps Ambu off his feet, all on a sudden! Well, Ambu opens up his love before her; it is the journey of Ambu to know whether she loves him back or not, which constitutes ‘Matchbox’. With nothing much in its belly, ‘Matchbox’ heavily relied on the joyous and friendship moments that the hero and his group of friends enjoy. A wafer thin story line, the makers had an option of narrating the story within the timeframe of some 30 minutes or so; but they dared to come up with a feature film – and we should appreciate their courage. However, that doesn’t really mean that it is going to give a splendid product. Offering some clichéd moments, with unimpressive narrative pattern, ‘Matchbox’ fails to ignite the quest for freshness. In order to make it a fully fledged feature film, makers have indeed incorporated elements of some action moments, couple of songs and some cat and mouse games – which in turn were intended to deliver comic relief. In an attempt of ghettoing the whole movie into the aforementioned elements, director Sivaram Mani’s ‘Matchbox’ hasn’t paid enough attention to wield a strong story. The script by Nikhil Anand and Kenny Perusy, could have invested a bit more effort to translate their time to forming a meaningful script. In terms of performances, the youngsters retained all the expressions from their previous movies, but it proves that if not pruned appropriately by a mentor, they might not be going to stay in this business for a long time. Director Sivaram Mani, though hasn’t showcased his potentials, however ensured that if given a proper script, eh could well come up with a decent film. Maybe, it was just a tough start for him this time..!